37 C.F.R. 1.175 Inventor's oath or declaration for a reissue application. (a) The inventor’s oath or declaration for a reissue application, in addition to complying with the requirements of § 1.63, § 1.64, or § 1.67, must also specifically identify at least one error pursuant to 35 U.S.C. 251 being relied upon as the basis for reissue and state that the applicant believes the original patent to be wholly or partly inoperative or invalid by reason of a defective specification or drawing, or by reason of the patentee claiming more or less than the patentee had the right to claim in the patent. 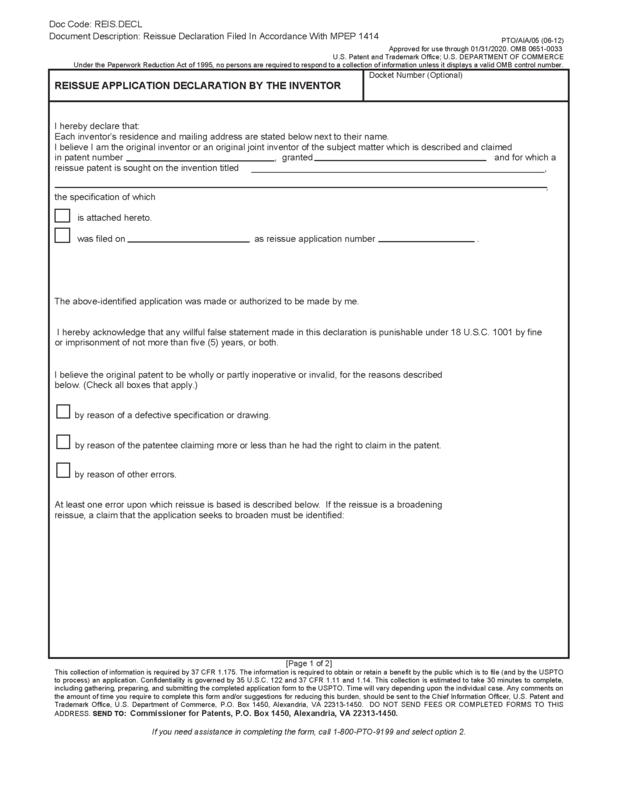 (b) If the reissue application seeks to enlarge the scope of the claims of the patent (a basis for the reissue is the patentee claiming less than the patentee had the right to claim in the patent), the inventor’s oath or declaration for a reissue application must identify a claim that the application seeks to broaden. A claim is a broadened claim if the claim is broadened in any respect. (2) The application for the original patent was filed under § 1.46 by the assignee of the entire interest. (d) If errors previously identified in the inventor’s oath or declaration for a reissue application pursuant to paragraph (a) of this section are no longer being relied upon as the basis for reissue, the applicant must identify an error being relied upon as the basis for reissue. 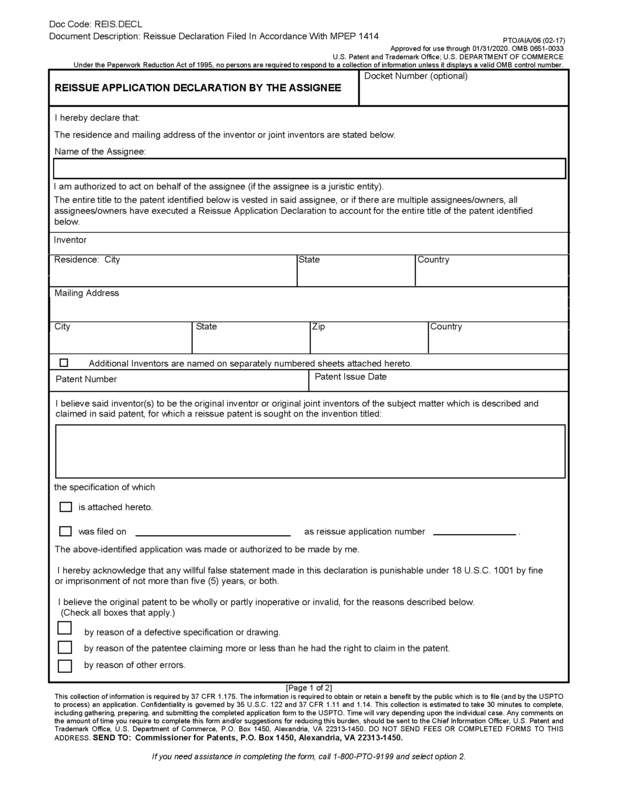 (e) The inventor’s oath or declaration for a reissue application required by paragraph (a) of this section may be submitted under the provisions of § 1.53(f), except that the provisions of § 1.53(f)(3) do not apply to a reissue application. (iii) The application for the original patent was filed under § 1.46 by the assignee of the entire interest. (2) If all errors identified in the inventor’s oath or declaration from the earlier-filed reissue application are no longer being relied upon as the basis for reissue, the applicant must identify an error being relied upon as the basis for reissue. (g) An oath or declaration filed at any time pursuant to 35 U.S.C. 115(h)(1), will be placed in the file record of the reissue application, but may not necessarily be reviewed by the Office. (B) state that the application was made or was authorized to be made by the person executing the oath or declaration. Depending on the circumstances, the inventor’s oath or declaration for a reissue application can be (a) a reissue declaration by the inventor, (b) an assignment by the inventor containing the statements required by 37 CFR 1.63 and 1.175 ("assignment-statement"), (c) a reissue declaration by the assignee, or (d) a substitute statement by the patentee, or the current patent owner if there has been an assignment. In accordance with 37 CFR 1.63(c), a person may not execute an oath or declaration for an application unless that person has reviewed and understand the contents of the application, including the claims, and is aware of the duty to disclose to the Office all information known to the person to be material to the patentability as defined in 37 CFR 1.56. 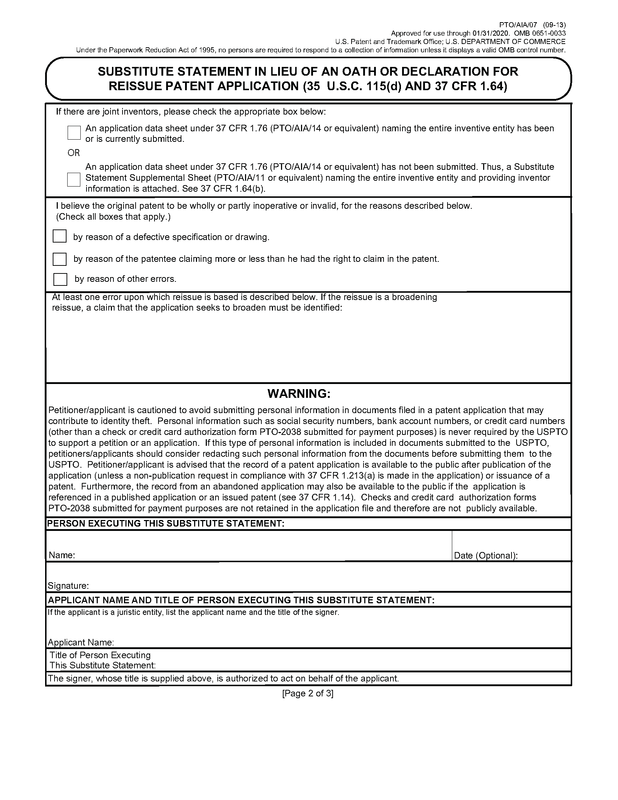 See also the discussion regarding the requirements of an oath/declaration beginning at MPEP § 602. 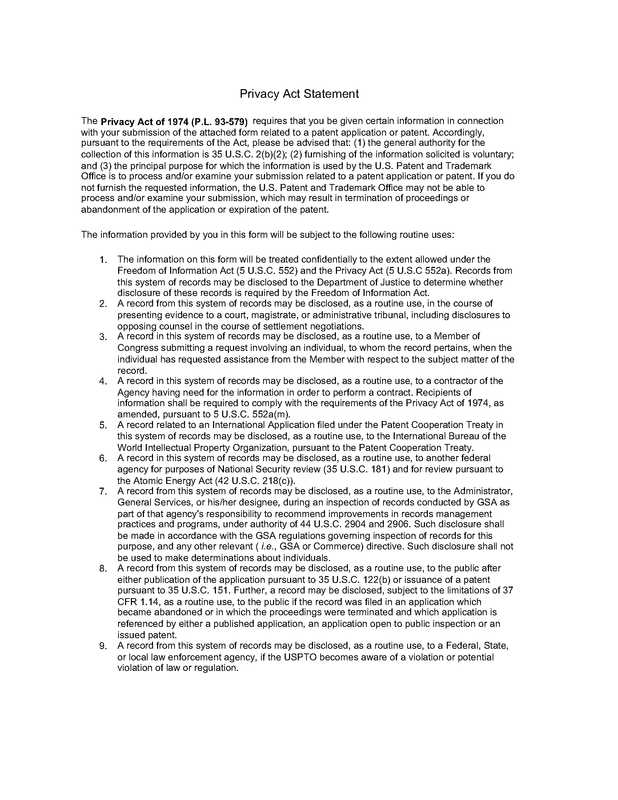 See also MPEP § 604 for the requirements of a substitute statement under 37 CFR 1.64. 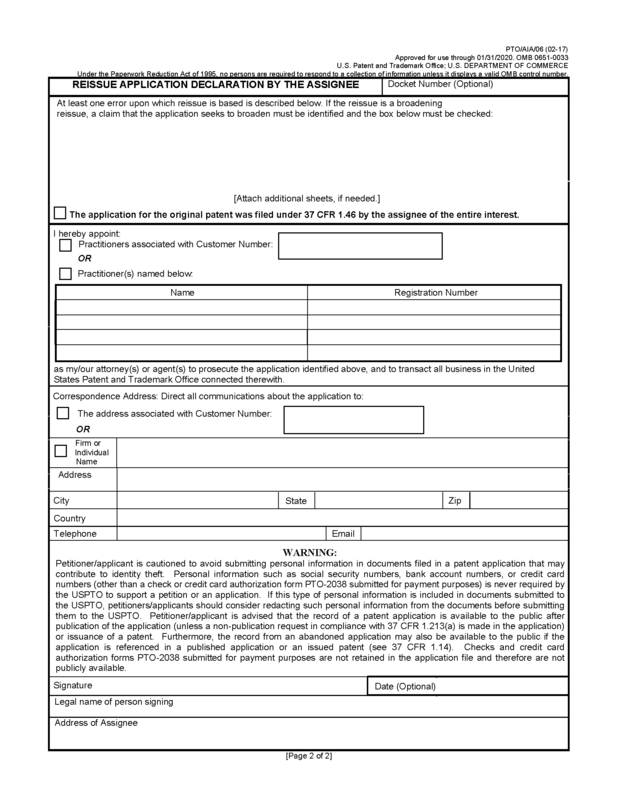 Unlike in non-reissue, non-provisional patent applications, submission of the inventor’s oath or declaration in a reissue application cannot be delayed until payment of the issue fee. The application must contain the inventor’s oath or declaration executed by or with respect to each inventor before the case can be released for examination. See 37 CFR 1.175(e). 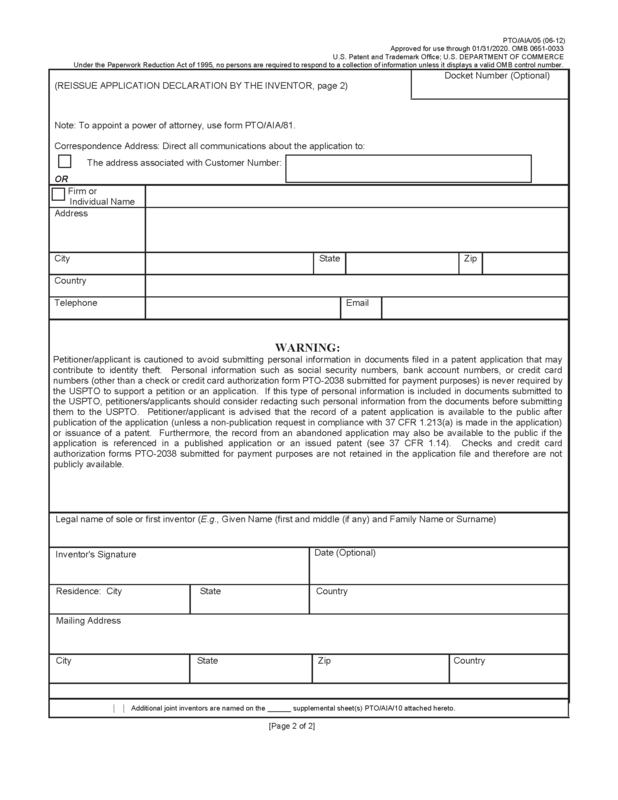 The assignee of 100% of the entire right, title and interest in the patent (who must be named as the reissue applicant) may sign the declaration if the application does not seek to enlarge the scope of the claims in the original patent, or the application for the original patent was filed under 37 CFR 1.46 by the assignee of the entire interest. See MPEP § 605.01. 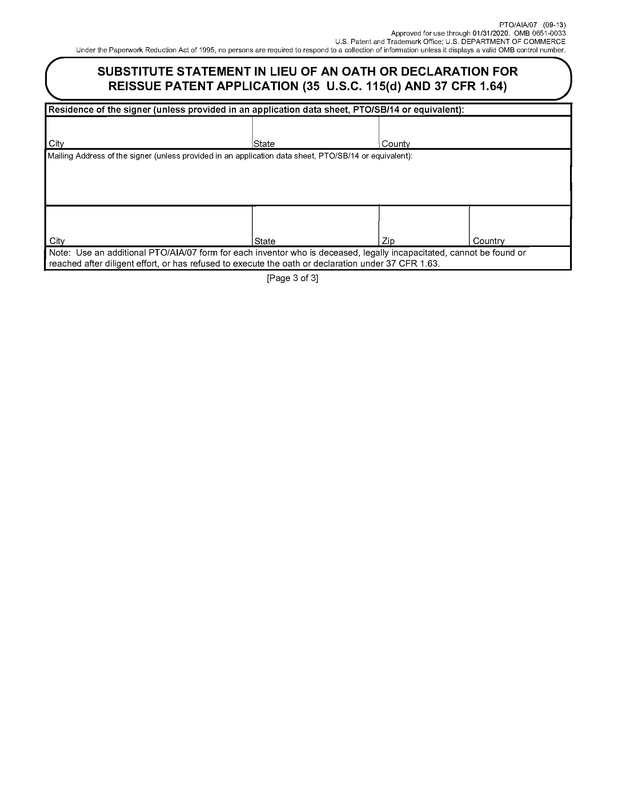 If the reissue applicant is a juristic entity, then the reissue declaration must be signed by an official of the applicant who has a title that carries apparent authority, or someone who makes a statement of authorization to act (e.g., an employee of the assignee who by corporate resolution of a Board of Directors has been given authority to act on behalf of the juristic entity). See MPEP § 325. A patent practitioner may only sign the reissue declaration as an official of a juristic entity applicant if the practitioner has been given authority to act as explained above and may not sign the substitute statement merely on the basis of having power of attorney in the application. 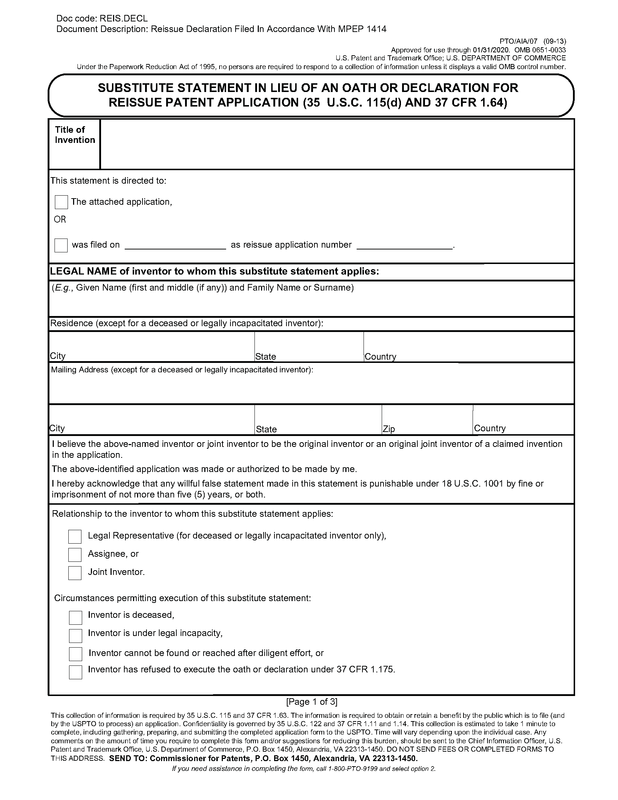 The patentee, or current patent owner if there has been an assignment, may sign a substitute statement, in accordance with 37 CFR 1.64, on behalf of an inventor who is deceased, legally incapacitated, cannot be found or reached after diligent effort, or refused to execute the oath or declaration under 37 CFR 1.175, even if the reissue application was filed to enlarge the scope of the claims (e.g., a broadening reissue ). 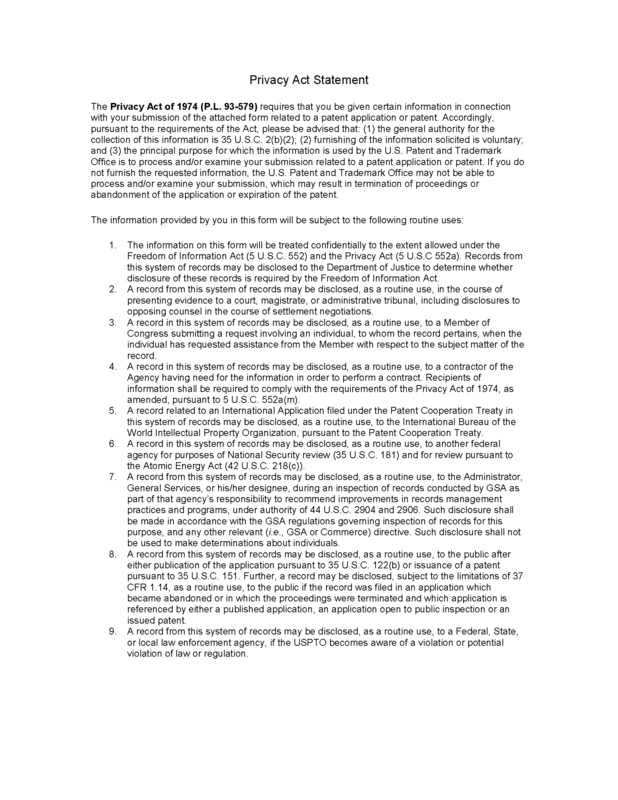 This procedure is provided for in 37 CFR 1.175(c) by the language "except as provided for in § 1.64." Depending on the circumstances, form PTO/AIA/05, Reissue Application Declaration By The Inventor, form PTO/AIA/06, Reissue Application Declaration By The Assignee, or form PTO/AIA/07, Substitute Statement in Lieu of an Oath or Declaration for Reissue Patent Application (35 U.S.C. 115(d) and 37 CFR 1.64 ), may be used to prepare a declaration in a reissue application.